Why bake when you can shake? I have a huge sweet tooth plus I'm lazy and don't like to bake much so I have a ton - seriously, a ton - of Dessert Cocktails. 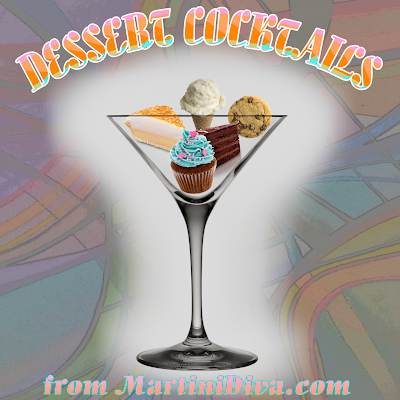 Many are directly inspired by famous or popular dessert recipes. I've been creating original cocktail recipes since 2005 and when you combine that much time with my kind of sweet tooth you end up with a pretty hefty list. CAKE COCKTAILS CANDY COCKTAILS CARAMEL COCKTAILS CHEESECAKE COCKTAILS CHOCOLATE COCKTAILS COOKIE COCKTAILS CUPCAKE COCKTAILS ICE CREAM COCKTAILS PIE COCKTAILS TRUFFLE COCKTAILS SUNDAE COCKTAILS If the recipe is not in one of my dessert cocktail categories, or happens to be a favorite of mine, you'll find it listed alphabetically BY DESSERT below: APPLE PIE COCKTAIL ANIMAL CRACKERS IN MY BOOZE BANANAS FOSTER BOOZY SHAKE BLACK FOREST CAKE COCKTAIL BOYSENBERRY RUM FLIP BRANDY ALEXANDER BOURBON ALEXANDER BROWN COW BEER FLOAT BROWNIE MARTINI CAPPUCCINO MARTINI CHERRIES JUBILEE MARTINI CHERRY CLAFOUTIS MARTINI CHOCOLATE FONDUE COCKTAIL CHOCOLATE PORTER BEER FLOATS CHOCOLATE STRAWBERRY MARTINI COCONUT DAIQUIRI CREME BRULEE COCKTAIL CREPES SUZETTE COCKTAIL DECADENT DUTCH COCKTAIL FLOAT DERBY PIE COCKTAIL DRUNK ELF ON A SHELF DRUNK RUSSIANS DRUNKEN BABY DOLE PINEAPPLE WHIPS DRUNKEN OREO TRUFFLE COCKTAIL GOLDEN CADILLAC GRASSHOPPER PEACH MELBA BEER FLOAT PEACH MELBA MARTINI PEACHES & CREAM MARTINI PEARS HELENE MARTINI PECAN PIE MARTINI PINEAPPLE DRUNK SIDE DOWN SMASH PINK SQUIRREL RASPBERRY TRIFLE MARTINI SALTED CARAMEL APPLE COCKTAIL SAMOA COOKIE BOOZY SHAKE S'MORES COCKTAIL STICKY BUN MARTINI STRAWBERRY SHORTCAKE MARTINI STRAWBERRY SUNDAY MARTINI STRAWBERRIES & CREAM MARTINI TIRAMISU MARTINI Many of my EDIBLE COCKTAILS are dessert inspired as well. National Dessert Day is October 14th.